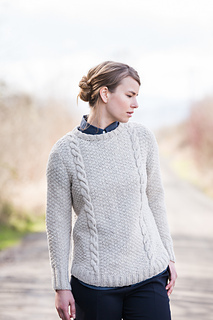 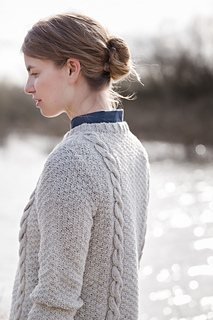 A curved short-row hem and mirrored suspender cables dress up this comfortable pullover in double moss stitch. 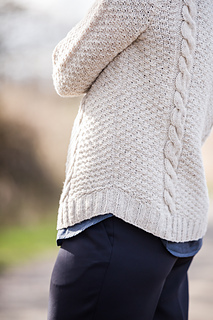 The cables’ width is graded to match the finished dimensions of the sweater to ensure perfect proportions. 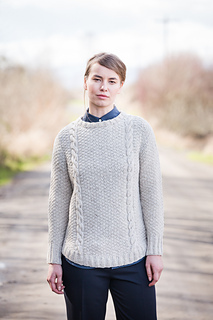 The front and back are worked flat from the bottom up, with short rows shaping the hems; the straight torso makes for a long swath of predictable knitting. 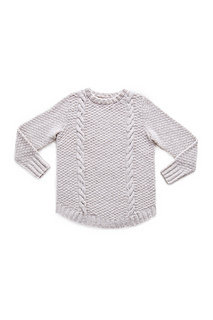 Set-in sleeves are knit circularly to the armholes and then completed working flat for a tidy fit and a stable finish. 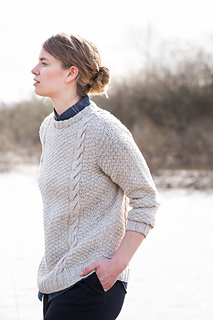 The ribbed neckband is worked to double length and then sewn down inside for a strong and elastic finish. 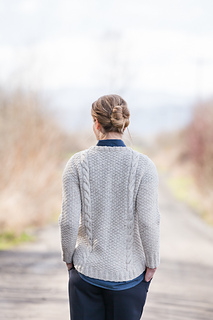 Valemount’s longer length, soft texture and classic look make it a wardrobe staple you’ll wear for years. 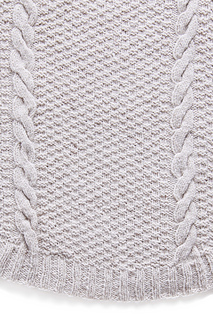 The gentle stitch play of the double moss background will most visible in a pale colorway like Fossil (shown in the sample), Snowbound, Tallow, or Bale.